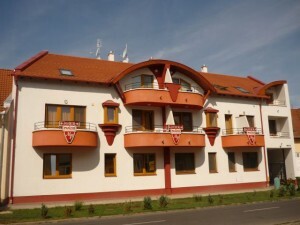 This nice, familiar pension is situated in a peaceful area of the well-known spa town, Hajdúszoboszló, only 8 minutes’ walk from the entrance of the thermal spa and 2 minutes’ from the summer entrance pf the open-air bath. Our pension have four family rooms (suitable for 4 people each), and 13 twin rooms, some of which have extra bed too. Rooms equipped with bathroom, toilet, sat tv, refrigerator, hotel furniture, safe, and wifi connection point. The whole pension can accomodate up to 50 people at the same time. Our closed car park provides safe places for the guest’ cars for free. A separated banquet hall suitable for 70 people is available in the cellar of the pension. The undertake to organise wedding parties, birthdays, corporate parties, and other events. Catering and accomodating groups can also be provided.